A quick snippet about a MUST-SEE. I saw Abrahamse and Meyer’s production of Richard III at the Market Theatre in 2011 and was BLOWN AWAY. Lots of CAPS, bolds, italics and underlinings in this blog. You get it ? EmphaSIS. So based on that I made sure I saw the same directors’ production of Hamlet in 2017. 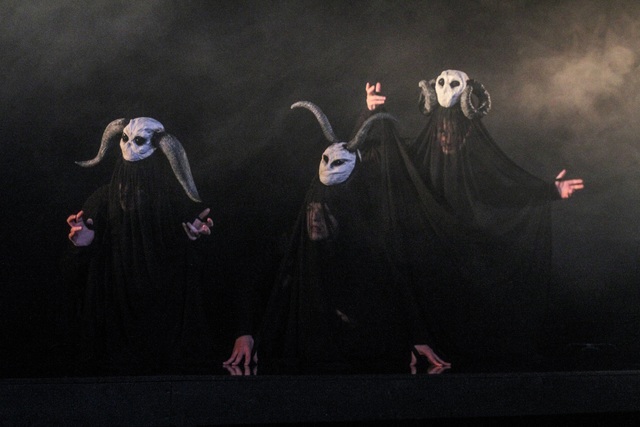 And now Abrahamse and Meyer’s production of Macbeth comes straight from its debut at the 11th International Shakespeare Festival in Craiova Romania. The production features direction, set and lighting design by Fred Abrahamse, costume design by Marcel Meyer, illusions by Matthew Baldwain and a soundscape by Charl-Johan Lingenfelder. Abrahamse and Meyer have also collaborated on the puppet design and creation. Gayle Edmunds on Channel 24 describes the roles of the 6 actor all-male cast: With the aid of puppets, masks and simple costume changes Stephen Jubber morphs from Duncan to Macduff, and Tristan de Beer from Third Witch to Lady Macbeth, to Fleance. Tailyn Ramsamy meanwhile takes on the roles of Banquo and Lady Macduff. The final members of the cast are Matthew Baldwin (First Witch, Malcolm, Murderer and Ross) and Jeremy Richard (Second Witch, Donalbain, Porter and Murderer). This is one production I am NOT going to miss. Stay at our well located Guest House and visit nearby theatres. View our Rosebank Guest House for Rates and Availability! 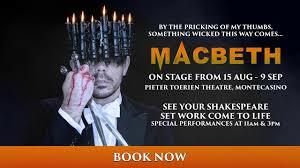 The tickets (book through Computicket) for this two-hour production cost from R100 – R180. The 3 witches with eerily portrayed with animal skulls and horns amid swirling smoke. In Shakespeare’s time women were not allowed to appear on the stage so it is apposite that the 3 witches are played by men.